And part three brings us to today, the finished flat, and the story of how it ended up on the front cover of the Skånskan sunday paper. 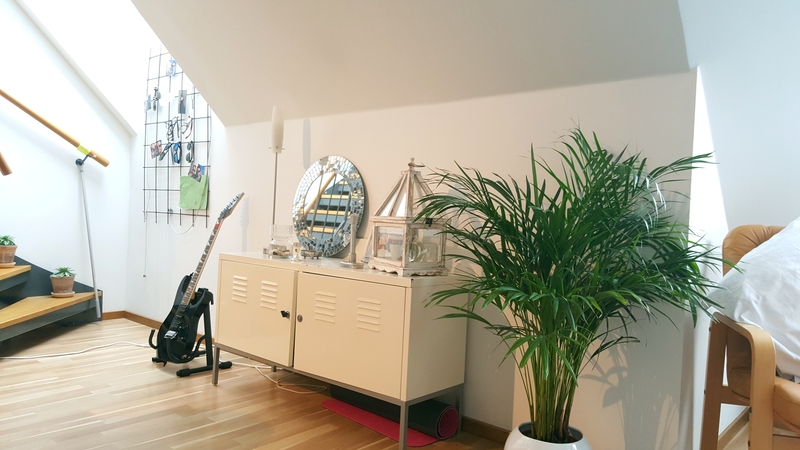 It’s kind of unbelievable to think that within a month of moving to Sweden I’d find myself being interviewed in regards to our new home and how we’ve decorated it, but alas, stranger things have happened. First, let’s take a quick look at the finished flat. We tried to keep our home quite bright and lively, mixing lots of textures and items. You’ll notice the life that’s brought to the room simply by introducing a few plants here and there. Take note of the hanging plants in the top right of our living room making efficient use of the space that we have. You can learn how to create your own here. The oil painted elephant canvas, seen above our sofa, was an unwanted item that we quickly snatched up to give it a new home. And our “marble” coffee table is in fact an old IKEA table given new life with a plastic wrap. A fun little DIY project with great results (I may write a little more about this one day). We pair our DUX leather armchairs with a hammered metal side table to create a cosy little coffee area under the window, one of our favourite places in the flat. The entertainment area is of course completed with a PS4, mini speaks for some chilled tunes and a delicately placed Telecaster, which all enjoyed a comfy airplane journey over. Our metal locker side table was bought from Erikshjälpen at an extremely reasonable 110kr giving us some extra surface space. It was a slightly awkward experience trying to bring it home on the bus, but we got it back eventually. The table is decorated with a mixture of materials similar to the rest of the flat. Some metal, some wood, some glass. We like to mix things up. The concept of creating ‘skylines‘ with your items was a new one introduced to me by Maddie, and it is an effective one. A few more plants, personal touches and Maddie’s guitar finish the area. And this is the story of how we found ourselves being interviewed about our flat. It’ll be a quick little summary, which reflects on how quickly the opportunity came about. Simply enough, a local journalist (Caroline Stenbäck) and her photographer (Jörgen Johansson – who took the majority of the photos above) had an interview planned that happened to drop out last minute, leaving them in need of a story. Through a close friend and their connections, there was mention of our flat to one of the editors at Skånskan who felt that it would be an interesting story. Within hours Caroline and Jörgen were at our doorstep ready to speak to us and shoot the flat. By Sunday, it was already printed and out in the public. Bish, bash, bosh. Very quick turn around indeed. 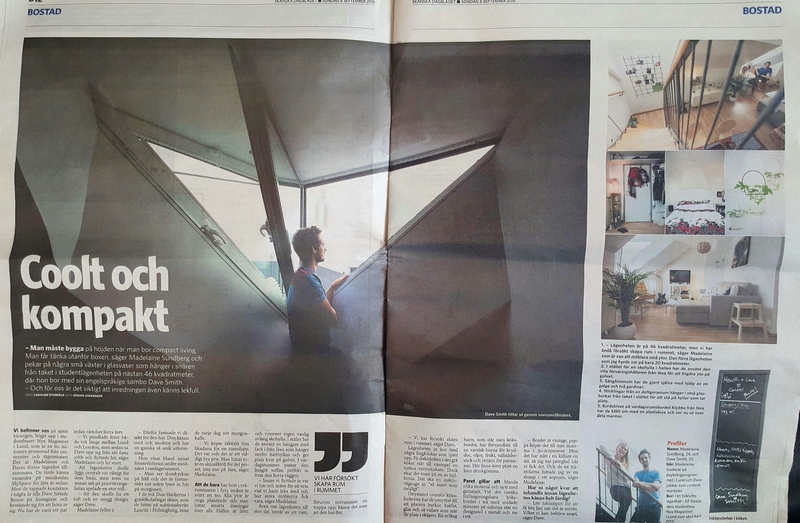 Below you can see the front page and double page spread article. And here’s quick link if you’d like to read it. So that’s our home! It came together quite quickly in around 3-4 weeks. 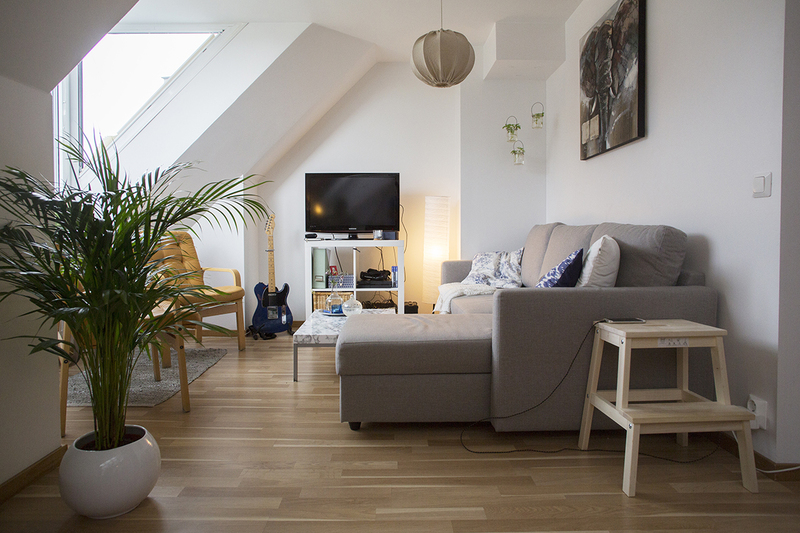 A lot of people have been shocked at how soon we managed to turned this flat into a home, but we had so much fun doing it that it felt like a breeze. We’re well and truly settled now, and as you can probably tell, both very proud of our little home. This looks gorgeous, love the idea of making skylines and the marble coffee table is just beautiful. Stunning – both the home and the blog. Thanks so much for the kind comments Emmazingfood! Really appreciate it.